MT19 REAR AXLE MODIFICATION KIT - Includes a keyless steel axle and a U.S. Tsubaki MT19 Power Lock hub and sprocket as described in Tom Norman's article in the Mar/Apr2001 SETOFF. Also available is the bracket and a second idler sprocket similar to that described in the article in the Nov/Dec 2000 SETOFF. We will sell the parts individually or as a kit and will do the complete, axle, powerlock and bracket and second sprocket modification at our facility in Ohio if desired. Keyless Axle, Dual Idler Bracket, Idler Sprocket & Keyless Axle Sprocket We have completed our dual idler bracket which allows for the installation of a second idler sprocket. This is a similar bracket to the one described in the "SETOFF" article. It allows the drive chain to travel in a path that produces much less stress on the rear axle. The photo at left shows everything to make the complete modification. The installation of these components on a steel keyless axle should further reduce axle stress because of the elimination of the key way. 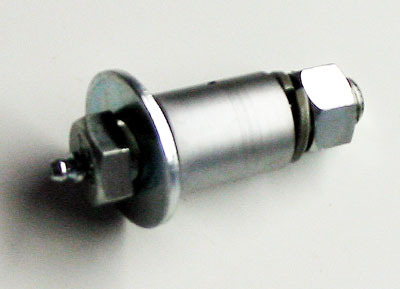 The axle key way weakens the axle and provides a point for stress concentration which has lead to axle failure at or near the key way in the past. The illustrated axle sprocket is made by U.S. Tsubaki to our design and has a tapered "Power Lock" which eliminates the need for a key way. A number of cars have been run with this sprocket throughout the 2001 season with excellent results. Many MT19's in the hobby came from the Canadian National Railway. The CN used a double #40 dual drive chain. We have now obtained sprockets designed for this dual chain drive assembly so these cars can also benefit from the axle modification. 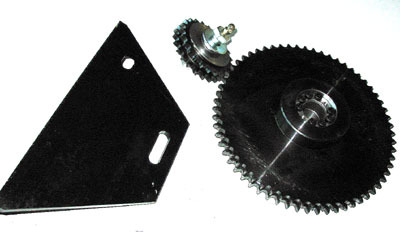 The dual idler and sprocket are illustrated at the left. In this view, the difference between the dual 40 and single 50 chain axle sprockets are clearly visible. We produce the bolt and spacers required to attach the idler sprocket to the bracket. This includes a grease fitting and a harden and ground spacer drilled for a grease channel. The bolt and spacers are available with or without the idler sprocket. They will work with both the dual and single idler sprocket. Here is the completed installation viewed from the right side. Note how much greater the clearance is between the chain and brake shaft than in the original installation. Also note the grease gun hoses used to extend the grease fittings to the outside of the car frame for easy servicing. The slippage marks were applied to each bolt on the powerlock as well as the axle after setting bolt torque to 12.3 foot pounds. Left side of the installation. Note the center bearing has been reversed, with the mounting point now aft of the rear axle.The mounting hardware for the dual idler bracket is visible. So, you want to take one of those exotic trips in your MT19 but have heard stories about rear axles breaking. The last thing you want is to have your axle break halfway to Tumbler Ridge or in the middle of the Copper Canyon. What to do? 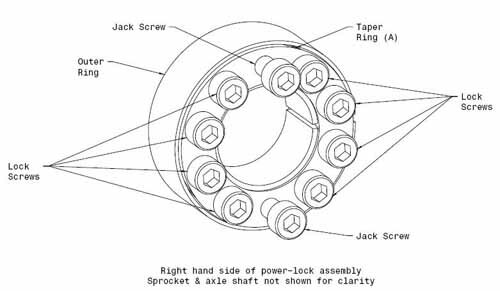 Well, in recent years several NARCOA members have researched the cases of broken MT19 rear axles and determined that the original installation design lead to excessive flexing of the axle under certain conditions, which ultimately caused axle failure. 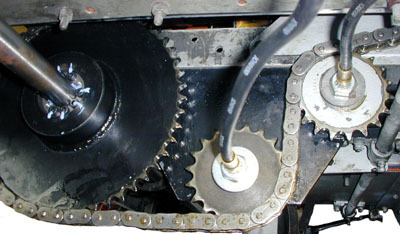 In an effort to correct the problem, a second chain idler sprocket was mounted on a redesigned bracket that eliminates much of the excessive axle flexing by changing the path of the drive chain. This modification is described in the Nov./Dec. 2000 SETOFF in detail. We now produce this special bracket. A new rear axle made of 4150 HT turned, ground and polish steel which provides much more strength than the original axle has recently become available. Since most axle failures occurred at the keyway which is the weak point of the original axle design, it has been eliminated by using a U.S. Tsubaki “PowerLock” keyless sprocket. The details for the axle and sprocket were published in the Mar./Apr 2001 SETOFF. Anyone contemplating a rear axle replacement should read both these articles. A number of cars have been modified and have run long distances during the 2001 season with no failures. In order to install the dual idler bracket, you will have to reverse the center axle bearing so that the support bolts are behind the rear axle. (A few later cars were built this way by Fairmont in an apparent attempt to solve the breakage problem) You must remove or at least partially remove the rear axle in order to reverse the bearing block as just flipping it 180 degrees on the axle will not work due to the shape of the casting. If you are going to install the bracket, you might as well change the axle at the same time, since the rear axle may be near the point of failure and your going to do almost all the work anyway. A few special tools make the job much easier. You will need a 1-5/16” socket for the axle nuts. Probably the most difficult part of an axle change is removing the wheel hubs from the axle. Our hub puller works extremely well. It makes hub removal as easy as removing a wheel. A turntable makes the job much easier by allowing easy access under the car. Be sure the car is also blocked in position so that it cannot fall on you before going underneath. If you don’t have a turntable, you will need to find a way to lift the car while leaving the rear wheels and axle free to turn. A few things to think about before beginning. Check the gauge of the car by placing a tape measure through the “spoke” holes in the wheels and measuring from wheel face to wheel face. Fairmont calls for a dimension of 62-3/4” and cautions that the front and rear axle should be the same. If the rear axle is under gauge, you may want to change the insulators while you have the hubs off. If the front is undergauge, and you don’t want to pull the hubs to change the insulators, our shims can be ordered in 1/16” and 1/8” inch thicknesses to set the wheels to proper gauge and match the rear wheel gauge. Before you lift the car from the ground, break the wheel nuts, axle nut and the four Allen headed screws on the rear sprocket loose so the can easily be turned. Like changing a tire on your car, it is much easier to fight a seized nut on the ground. After the car has been lifted, hopefully using a turntable, make sure it cannot fall by blocking, jacking etc. as needed, then remove the drive chain, both axle nuts and both wheels. Inspect the wheels for flange wear and thickness. Measure the circumference of each wheel. If the are not both nearly the same, you will have additional axle forces due to the wheels trying to turn at different speeds on a solid axle. Next remove the wheel hubs. Put the axle nuts back on the axle to protect the thread and then install the hub puller. Most of the time, the hubs will come off with very little problem. I have had some that were really seized in place and when they finally broke loose, they made a report like a rifle. 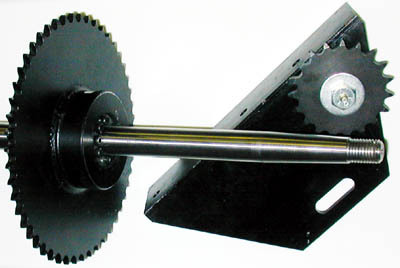 Loosen the thrust collars that hold the axle in position and slide them out of the way. Use a small file to dress out the area where the thrust collar set screw has made a mark in the axle. Now disassemble the two sprocket halves by removing the Allen screws and nuts. Fairmont used two different types of sprocket hubs. The earlier style had a bolt that pressed against the key in the axle. Removing this bolt should break the hub free. Later hubs used a tapered lock. If you have this style, note three bolt heads with two holes that have no bolts. Remove the three bolts and thread two of them into the holes that were not used and tighten. This will pull the taper lock out and free the hub assembly. Remove the two bolts that attach the center bearing to the frame. You should now have everything loose on the axle. The most difficult part of the job may be cleaning the rear axle. All paint, dirt, grease etc. must be removed as the axle will have to slide out to one side or the other through the wheel bearing which has a very close fit. Use sandpaper, emery cloth, Scotch Bright Pads, paint stripper and what ever else is needed to be sure the axle is as smooth and clean as new. Attempt to slide the axle out one side. If it begins to bind, polish out the area that is causing the problem and try again. The bearings have a very close fit and the axle should not be forced when sliding it out. Okay, you now have the axle and all components laying on the floor and are nearly ready to install the new bracket. Remove the old idler bracket assembly. You will reuse the same holes and hardware that held the old bracket. Count the teeth on the original idler sprocket. If it is a 17 tooth sprocket, you will need to get a 19 tooth sprocket to match the one supplied in the kit. (The holes in the bracket are for dual 19 tooth sprockets.) Inspect the condition of the old idler sprocket as well as the forward sprocket on the transmission. Check the teeth for wear, gouges, etc. Replace as needed. The new dual idler bracket can now be installed. A section of the bracket is milled out to accommodate the battery hold down nut. The bracket has four mounting holes that align with the bolt locations for the old idler bracket and center bearing when it was in the original position. Be sure the bracket is exactly parallel with the car frame and then tighten the nuts. The original Idler sprocket shaft used a special zerk style grease fitting that was threaded in a very small hole in the shaft head. Our new idler shafts are drilled and taped to 1/8” NPT for a standard zerk fitting. Grease gun extension hoses, available in various lengths at the local hardware store, can be threaded into this shaft and passed through the car frame using a coupler and zerk fitting on the outside of the car. If you do the same to the center bearing and all wheel bearings, you will be able to grease the car without crawling underneath. You will need to order a second idler shaft or have the original one drilled and tapped for 1/8” NPT to attach the grease hose. The top sprocket may be installed and tightened using the lock washer and nut provided in the kit. Install the lower sprocket, but do not completely tighten yet as it must be moved to adjust chain tension. I installed a flat washer under the lock washer to make it easier to slide the sprocket in the elongated hole when adjusting the chain. Before going any further, it would be a good idea to do a little inspecting. Check the brake shaft in the area underneath the drive chain. Many cars with loose chains will have damage to the brake shaft. Do not operate the car if the shaft is damaged. Order a new one or perform a proper repair on the old one but don’t let it go. Any wear is unacceptable as it could lead to brake failure. This next step is optional and not required for the installation of the axle or idler bracket, but since the axle is removed, it is much easier to do now than it any other time. Check the springs. If they are in poor shape. You will never get a better chance to replace them. 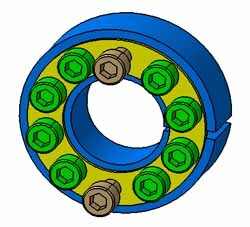 The same goes for the oilite guides which allow the bearing casings to move vertically. If you decide to remove the springs or check the oilite guide bushings, you must remove the bearing casings. To do so, you must drop the aluminum channel (rail skid) that passes under both the front and rear wheel bearing casings. Remove the two long bolts that pass through the guide tubes in the rear bearing casing. Remove the two lower bolts that hold the rail skid to the triangular shaped gusset plate just forward of the rear axle as well as the bolts in the gusset plate just aft of the front axle. Remove the single bolt that holds the brace to the center of the rail skid. Now loosen, but do not remove the nuts from the bolts that pass through the casing guide tubes on the front axle. Don’t loosen them too much as you don’t want the front axle to drop out of position. Do one side of the car at a time. The rail skid should drop down enough to allow the bearing casing and springs to be removed. If you open the bearing casings to check bearing condition, be careful of the shims. Don’t loose any and make sure they go back in the proper position. If you replace the bearings, shim them according to Fairmonts instructions. If you need to replace the bearings or the guides, you will have to heat the casing to get them out. The rear springs are lighter duty than the front springs and are not interchangeable. It is a good idea to order a set of four of the special cylindrical nuts used to center the top of the springs. These nuts break easily and are often replaced with improper hardware in the field which can lead to spring failure. Reassemble the bearing blocks and rail skids in the reverse order that they were removed and properly tighten all hardware. Assuming everything is now in top condition, it is time to install the new 4150 HT axle. Insert the axle through the bearing casing and install in proper sequence, the thrust collars, center bearing (turned 180 degrees from the original - the bearing cover bolts will be on the left side) and the new “PowerLock” sprocket (Allen screws should be facing to the right). Don’t tighten anything yet. Do a runout on the axle to insure that it is perfectly straight and is not being offset by a bent frame or mis-positioned bearing casing. Drill two holes and mount the center bearing support. I did not install the center bearing spring as my understanding that Fairmont left them out in later cars as they were not needed. After the center bearing is mounted, check the axle runout again to be sure you got the center bearing properly positioned. 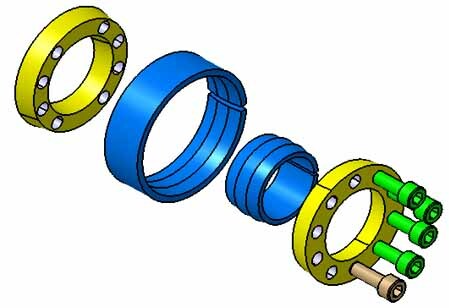 Before tightening the thrust collars, make sure that exactly the same amount of axle sticks through the bearing on each side of the car. Tighten the thrust collar clamping bolt before tightening the set screw. Don’t forget to safety wire the set screws Use stainless steel wire if possible. Carefully position the new sprocket so that it is exactly aligned with the forward sprocket on the transmission. The eight Allen headed screws were gradually tightened in a crisscross pattern and then torqued them to 12.3 foot pounds. A paint stripe applied to the “PowerLock” and axle can be used to detect any slippage. See the instructions and illustrations below for more information. Since the path for the chain is now slightly longer, I found that I needed to add two rollers for the chain to be long enough. Start by counting the number of rollers in your old chain. (Mine had 130) Install the old chain with the lower sprocket slid all the way aft. Position the chain so that the masterlink would go on the aft part of the axle sprocket and pull it as tight as possible. With both ends of the chain on the axle sprocket, you can easily count the number of links that need to be added. It is not a good idea to reuse an old chain or to add links to an existing chain, instead, just order a new one with the proper number of rollers and a new master link. Chains can only be cut with an even number of rollers, so if you need three instead of two, order an offset link. If you must cut the chain, pick up a chain cutting tool from a local bicycle or motorcycle shop. These tools are inexpensive and will keep you from damaging a new chain if it is too long and needs to have links removed. The SETOFF article indicates that the chain in this installation should be somewhat tighter than originally installed since the chain path length is more constant due to the geometry of the added sprocket. I found that if I tightened the chain until taught with the weight of the car off the wheels, with the car on the ground, the tension slackened slightly and seemed to me to be about right. Check the condition of the chain whip guard blocks. If they are worn, new blocks and or brackets should be ordered. Reposition them as needed for the new chain location. Reinstall the wheel hubs and snug them sufficiently to keep them secure. You can fully tighten them once the car is on the ground. Don’t forget to put the phenolic insulator washer against the hub and the metal washer under the nut or you will be setting off every grade crossing you pass! Check the condition of the wheel attachment hardware, replace as needed and reinstall the wheels. Lower the car to the ground and tighten the axle nuts. Install new cotter keys. Tighten all wheel nuts and check the gauge is you did before starting. Check that the wheels have equal distance between the inside of the flange and the car frame. Recheck chain tension and reinspect all work to be sure nothing has been missed. Your car rear axle and suspension should now be in top shape and ready for many years of happy motoring without problems. After a few hours of operation, recheck the torque on the PowerLock screws. Do it again at the end of the season. The POWER-LOCK® is composed of five parts: taper ring (A), taper ring (B), outer ring, inner ring, and locking screws. Locking is achieved by tightening the screws. 2) Remove the locking bolts from the POWER-LOCK® and clean and lightly oil, or grease the contact surfaces. Threads and seats of the locking screws must also be sufficiently lubricated. 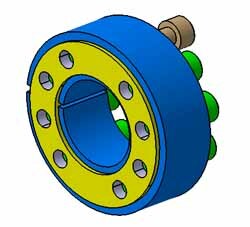 4) Next, determine the relative positioning between the hub and shaft (on the circumference and shaft line), and tighten the four screws positioned diagonally with 1/4 of the required tightening torque. Proceed to tighten the remaining screws in the same manner. 5) Increase the tightening torque to half of 12.3 foot pounds and tighten the screws in the same way as in Step 4. 6) Increase tightening torque to 12.3 foot pounds and tighten the screws. NOTE: There are ten holes in taper ring (A) with eight of them being lock screws The other two are jack screws. 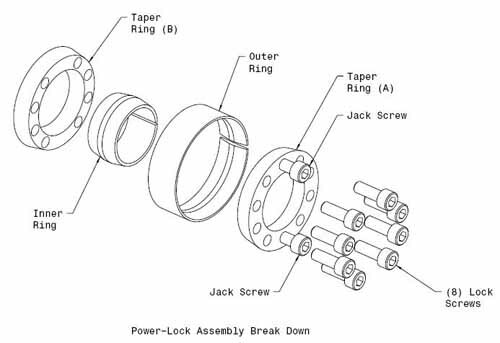 The jack screws are only required for removal of the power-lock hub either by pulling on the heads or turning them in against inner taper ring (B). 1) Make sure that no torque or thrust is being applied to the shaft and hub. When shaft and hub are heavy, take them off the shaft carefully. 3) If the POWER-LOCK is still locked even after loosening the screws, insert screws into the jack screw holes (see photo below) and screw them in until it unlocks. The drawings at left are courtesy of Wayne Schlueter and Illustrate in color the Power-Lock Assembly.